Have fun with the kids in Brooklyn! Here are some favorite family-friendly outings, especially popular among younger children, up to age 10. The first children's museum in the United States, this marvelous, multiculturally oriented, hands-on museum is a favorite for school groups. Many programs cater to tots and younger children. Whatever the exhibit here, it's bound to be creative, exuberant and global in scope. If you've got young children, this is a must-see. The perfect tiny zoo for little children, Prospect Park Zoo has wonderful exhibits for the little ones, both indoors and outdoors. Check out the quirky gophers and wonderful rabbits, as well as farm animals. Open 365 days a year. With over 50 acres, many annual festivals and wonderful children's educational programs, the Brooklyn Botanic Garden, in Prospect Heights and near Grand Army Plaza, Prospect Park, and the Brooklyn Museum, is a first-rate outing for kids. Outdoors, visit different gardens, walk through the magnificent Japanese Garden, explore the herb garden with signs in Braille, and wander the pathways here. Indoors, you can visit various "zones," going from moderate to tropical, look at the amazingly tiny bonsai tree collection, and more. The outdoor cafe area, near the coy pond, is a favorite. The new Visitors Center is wonderful, as is the gift shop. Check their calendar for children's classes. Walk in the door here, and you'll have to laugh because this tutoring center for students through age 18 masquerades as a "superhero store" selling caps, cans of magic invisibility powder and other science fiction products that will appeal to imaginative kids of all ages. The tutoring goes on behind a secret door. But it's a real store, so you can go in, buy superhero gear, and have a chuckle. What a great face-saving way for kids to get extra help with their academic work. A perennial favorite for kids, Coney Island is the place to go for the roller coaster and other amusement park rides, of course. And petite, family-friendly MCU Stadium nearby is the home of the Cyclones baseball team. You can go to the beach in Coney Island, get a hot dog at Nathan's or pizza pie at Totonnos, and visit the Coney Island USA Museum, too. The beach is crowded, busy and noisy during the summer; the boardwalk, with fresh Atlantic Ocean breezes, is too. Prospect Park's Audubon Center, in a handsome historic structure situated above the water, is an interesting place for children to explore. And, kids can participate in special classes and events held every week here, including crafts, games, and more. Brooklyn's library system is a treasure chest of opportunity for young children. Of course, there are children's reading rooms in every library, including the Central Library at Grand Army Plaza. Kids can learn to use computers, listen to stories, and see films. It's all free. Check out the library calendar for the Central Library or your local branch. Lefferts Historic House, in Prospect Park, brings the past alive for children, with free programs of crafts, readings, and adventures. Check their schedule to see what's on today. This 18th-century Dutch house is located in the Park’s "Children’s Corner," right near the Carousel and the Prospect Park Zoo. Little children love Puppetworks Theater in Park Slope. Book tickets in advance and treat your children to tried-and-true, family-friendly classics. Brooklyn boasts a couple of carousels. 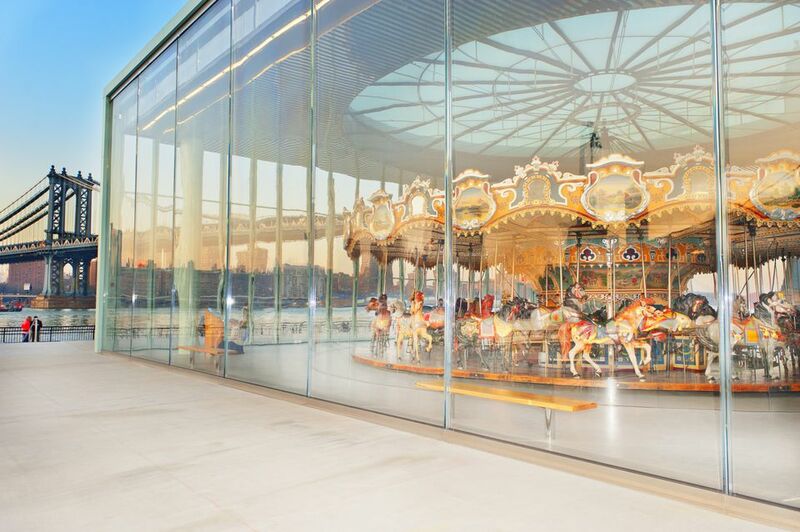 Have a ride in DUMBO on the wonderfully refurbished Jane's Carousel. Or, head to the merry-go-round in Prospect Park. Either way, this is a wonderful way to spend a few hours with young children.